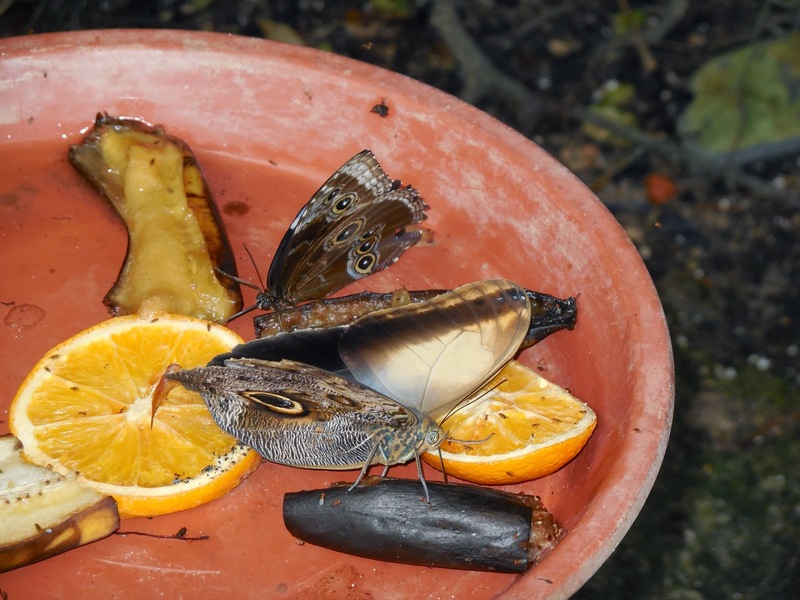 Butterflies enjoy the nectar from the rotting fruit (bananas and orange slices) set out each morning. For them, sipping on it is intoxicating. Yes, they get "drunk" from the fermenting fruit, then fly off in search of a mate. Did you know that these tiny ants in the pix are the enemy? Ants love to devour butterflies! Oh, and it is never good to touch the wings of a butterfly. The scales of a butterfly can stick to your fingers...a film that belongs on their wings. After all, Lepidoptera, a large order of insects that includes butterflies and moths is taken from the Greek meaning...scale wing. 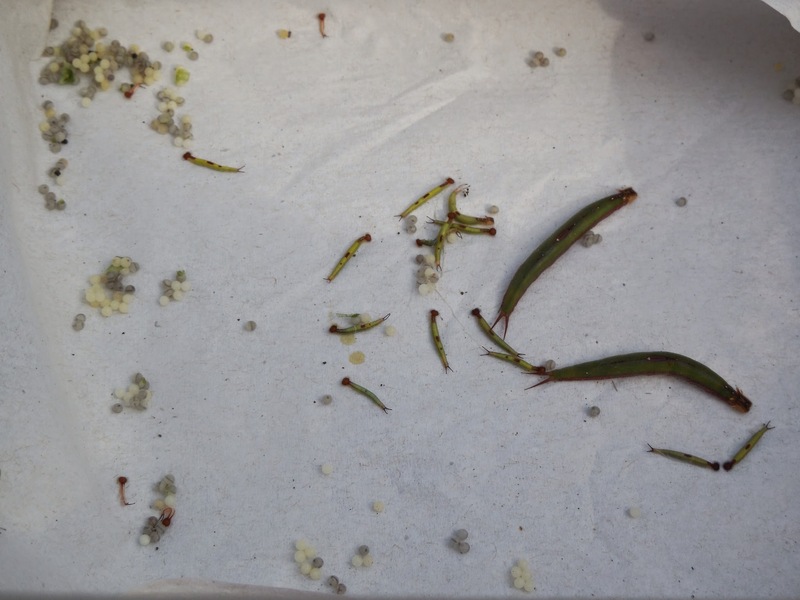 and eggs from the Swallowtails. The elongated are various stages of the Owl caterpillar while the tiny pearl shaped eggs are from Swallowtails, who lay their eggs on the citrus plant. In this picture, you can see the approximate size of the caterpillar (several inches long) in relation to the plant. On one of my morning visits, I was elated when an Owl Butterfly landed on me. Extracting nutrients from my skin (salt and minerals), it seemed happy enough. After all the thing it had to worry about was being "camera shy." Gorgeous butterfly, I like it's name! Was it your first experience? What an interesting guy ! Very interesting! I'm going to put out some orange and bananas. What an amazing guy! just a beautiful thing. :) i know you will miss your visits to the butterfly garden. what a beautiful butterfly. i can see why it's called the owl butterfly. and i didn't know that ants would eat butterflies. i once saw a dying praying mantis with ants crawling on him and i assumed they were eating him. it was kinda sad to see it though. i hate to see anything die. hope all is well. have a great weekend. What a gorgeous and unusual butterfly! 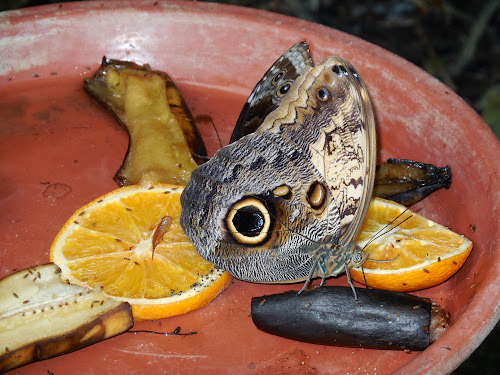 I can see why it is called the Owl butterfly! What an interesting butterfly. 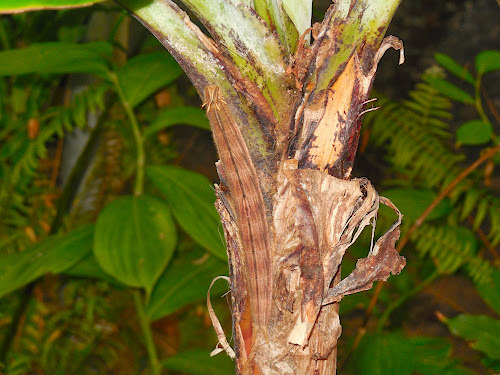 When I was in Key West, Florida, a few months ago, I visited the butterfly conservatory. It was an amazing experience. Butterflies are beautiful creatures (though I have to admit I am not fond of their caterpillar stage). I didn't know aunts eat butterflies! 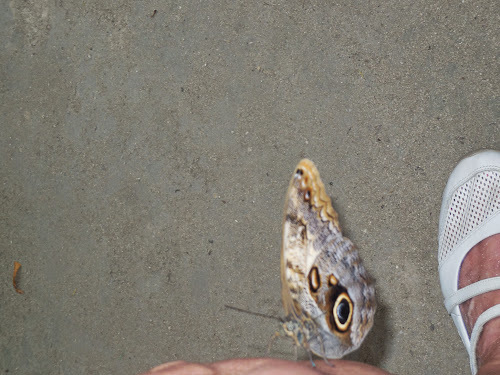 Fascinating butterfly, I didn't realize they would be interested in body salts like a sweat bee that once landed on me and was licking my shoulder.